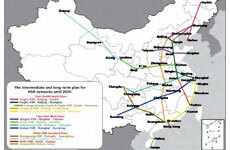 Although entering the transportation market at a later stage in 2003, Chinese HSR networks have become the largest in the world and are even growing faster than airline networks. Using 2013 origin/destination (O/D) passenger flow data, we compare the spatial configurations of Chinese urban systems in both high-speed railway and airline networks at the national scale. The outcome shows that, HSR dominant cities and links are mainly centralized in the middle and eastern parts of China offering regional connections, whereas air dominant cities and links are evenly distributed in the whole China offering interregional connections. That is mainly a result of that compared to airline networks, the strength of cities in HSR networks is more sensitive to socio-economic performance of cities, while the strength of links in HSR networks is more sensitive to the geographical distance between linked cities. Furthermore, HSR networks promote agglomeration economies of urban systems along the trunk lines in specific regions, whereas air networks relatively contribute to a more balanced urban development in China.